Many people who seek PTSD treatment suffer consequences of one or more traumatic events in their life. Even though many find ways to process trauma effectively and eventually resolve their issues through treatment, other individuals with multiple traumas may require more intensive support.PTSD treatment provides a healing environment for people with trauma-related issues and post-traumatic stress disorder (PTSD). It can also be beneficial for individuals whose trauma recovery may be more intricate due to other factors such as alcohol addiction, drug addiction or co-occurring disorders. Regardless of a person’s history of trauma, addiction or other mental health issues, progress starts once a person becomes aware of their trauma and acknowledges the way they respond. PTSD treatment helps individuals achieve this awareness in a therapeutic setting, by allowing a person to feel safe speaking about their experiences. For many, this is often the first time they have been able to do so. By accepting emotional support from others and learning the tools that are vital to overcoming trauma, those with trauma-related issues can make significant breakthroughs and are also able to create a strong foundation for recovery. Post traumatic stress disorder, or PTSD for short, is a mental health issue that is triggered by a traumatic event. It can occur as a result of either witnessing or experiencing such events and includes symptoms such as severe anxiety, nightmares, uncontrollable thoughts and flashbacks. Many individuals who go through terrifying events may have a hard time coping or adjusting for some time, but do not develop PTSD since self-care and time can help them to recover. However, symptoms that worsen or last up for several months or years, and hinder regular functioning are usually signs of PTSD. What is self-medication of PTSD symptoms? Many people with Post-Traumatic Stress Disorder (PTSD) try to numb their emotions by using and abusing alcohol and drugs, which is known as self-medicating. Around 31% of people who have had PTSD have also abused or been dependent on drugs at some point in their life, and around 40% in terms of alcohol. More than half of the individuals who are pursuing addiction treatment experience symptoms of PTSD and use substances like alcohol or drugs, along with other addictive behaviours to self-medicate, block or dull the difficult thoughts and feelings related to the trauma. How is trauma a risk factor for substance abuse? Trauma and substance abuse tend to co-exist in a number of ways. People who have unresolved trauma may develop drug, alcohol or behavioural addictions to numb their unwanted emotions, which can result in what is known as a co-occurring disorder. Studies show that up to 50% of adolescents with PTSD develop substance abuse issues, and also suggest that PTSD can make it harder for them to stop using. A person with earlier trauma may experience a range of physical symptoms that cause emotional distress, which may prompt behavioural patterns that regulate the emotions for a short period of time but eventually lead to more suffering. It is vital to recognise the physical symptoms, behavioural patterns and emotional stress associated with PTSD in order to fully recover from one’s past trauma. Seeking professional treatment at a PTSD treatment centre can reduce the likelihood of relapsing into active addiction. The Dawn Medical Rehab and Wellness Centre is a specially designed rehabilitation and wellness facility that has been created to foster an environment of healing and personal growth to help people facing trauma/PTSD. Our dedicated team of professionals and medical support are available onsite to ensure that each client receives the ideal balance between rehabilitation, wellness, therapeutic engagement and relaxation. Located in the beautiful city of Chiang Mai, Thailand, The Dawn enjoys easy connection to Bangkok and other major Asian cities. Our facility is perfectly positioned in a private and tranquil setting, and our discreet location and strict information sharing protocols ensure that our clients not only receive first class treatment, but guaranteed confidentiality and anonymity as well. In order to provide our clients with the best possible programme here at The Dawn, we provide an integrated treatment model to co-treat addiction and trauma disorders, along with a programme that focuses solely on treating PTSD. TRM is a body-based, or somatic therapy,which aims to reset the disrupted nervous system of those suffering from trauma. Clients are taught to observe and track their nervous system responses when they feel stressed, anxious or depressed. They learn mindfulness-based skills bring themselves back into balance when they are distressed. TRE yoga helps release tension or stress that is associated with PTSD by using exercises to release muscles that are triggered during the Fight or Flight response, and tend to stay contracted until the initial trauma has been resolved. Our clients have a minimum of three individual psychotherapy sessions per week with a Trauma-trained therapist. These sessions include trauma-focused CBT to address cognitive distortions and maladaptive impaired thinking associated with the traumatic events, and allow effective cognitive restructuring. 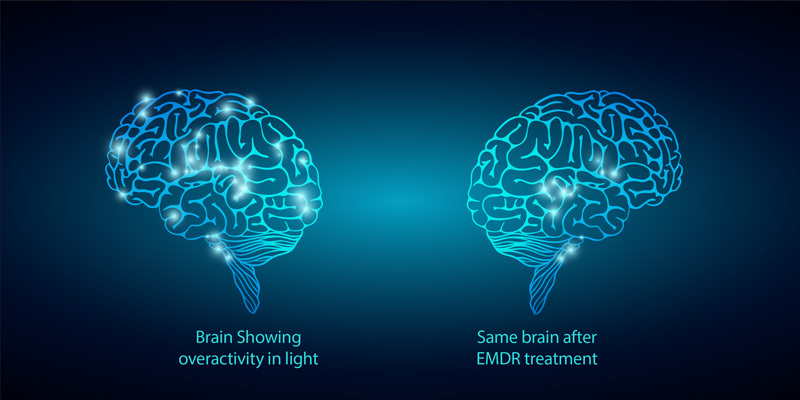 EMDR is designed to improve the distress and heal from symptoms linked with traumatic memories through physiologically based therapy that helps our clients view the event in a less traumatic way. It comprises bi-lateral eye movements, which aid in moving painful memories from the minds forefront into the long-term memory. Only eight sessions already dramatically reduces symptoms of PTSD. Repeated studies have found that using EMDR allows people to receive the benefits of psychotherapy that previously took years to have an effect. There have been numerous positive controlled outcome studies conducted on EMDR that show a significant reduction in PTSD symptoms after relatively few EMDR sessions (usually eight one-hour sessions). EMDR therapy is now widely known as an evidence-based Level 1 treatment due to its clinical efficacy in treating PTSD, and evidence of its clinical efficacy continues to accumulate across a broad range of psychopathologies. The underlying approach to giving proper trauma care is centred around establishing a strong, dependable, and highly visible support network for the affected person. Only in such an environment will they begin to let down their guard – but it is worth keeping in mind that such endeavours require patience, and that habitual behaviour learned over a long period of time will also take a long period of time to undo. The Dawn’s residential PTSD treatment in Thailand is led by a team of trauma-trained psychotherapists. Our high level of care and support, along with our beautiful and serene setting, guarantees that those who are seeking treatment for their PTSD and trauma disorder have a safe place to heal and recover. We recommend a minimum of 60 days for co-treating addiction and PTSD, and a 30-day minimum for independent PTSD treatment. Independent PTSD treatment in Thailand involves sufficient EMDR sessions to result in significant clinical improvement of PTSD symptoms.